Rivalry between the US and China broke into the open at the Asia Pacific Economic Co-operation meeting on Sunday, with leaders failing to issue a joint communiqué for the first time in the summit’s 29-year history, reports the Financial Times. According to FT, the competition between Washington and Beijing to influence the economic and political structure of Asia played out in real time as diplomats sparred over the wording of a closing statement on Sunday. 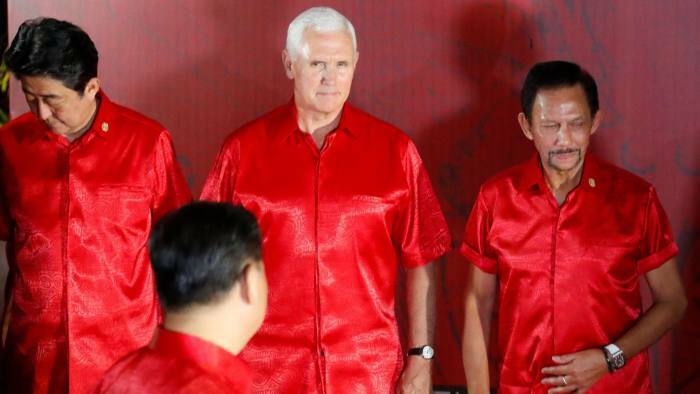 Vice-President Mike Pence, who attended the event after President Donald Trump snubbed the gathering, pushed for a vision of Asia tethered to Washington through bilateral trading agreements. Noted FT, "Mr. Pence’s appeal to Christianity in Asia at the end of his Apec speech also caused many in his audience to cringe." Bottom line: The United States wants to be the global influencer with more and more countries not liking the idea. Trump is bad. Pence is scary bad. I shall breath deeply and not panic.